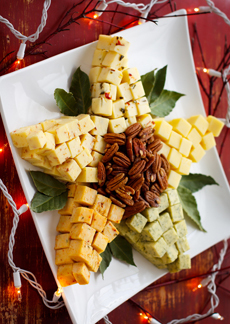 It’s easy to turn cheese into edible holiday art. Just look at these 10 examples, each easy to create at home. When you need a respite during holiday preparations, sit back with this history of cheese. Cheese dates back to before recorded history, perhaps as far back as 6,000 B.C.E. We know that cheese was part of the Sumerian diet, 4000 years before the birth of Christ, made from both cows’ and goats’ milk and stored in tall jars. Egyptian tomb murals circa 2000 B.C.E. show butter and cheese being made, and other murals which show milk stored in skin bags suspended from poles demonstrate a knowledge of dairy husbandry. An enormous variety of cheeses are made, in virtually every country on earth. Cheese varieties have been developed with the milk from a broad spectrum of animals—including the reindeer in Scandinavia, the boar in Africa, the water buffalo in Italy, the yak in Tibet, and the mare in Russia. Feta: Homer’s The Odyssey, written in the 8th century B.C.E., describes the making of the cheese that would later become known as feta. Emmental: Emmental, the Swiss cheese with eyes, was made by the Helvetians in the 1st century B.C.E. Cantal: In the first century, C.E., Pliny the Elder mentioned Cantal in his Historia Naturalis. Cantal, a cow’s milk cheese named after the Cantal Mountains in Auvergne, was originally produced by putting the curd into a formage, a wooden cylinder and the probable origin for the French and Italian words for cheese: fromage and formaggio, respectively. Countless people made cheese, sold cheese, and ate cheese as a diet staple before these cheeses and others earned their place in the cheese pantheon, bringing recognition to their towns and nations. Here is a look at cheese through history. How did cheese come to be? First, man discovered that domestic animals could be milked. While no one can be certain who made the first cheese, we can be certain it was an accident. Legend is that nomadic tribes of Central Asia who carried milk in animal skin bags “discovered” cheese. They carried milk in saddlebags made from animal skins, and possibly made from the stomach, which contains the coagulating enzyme known as rennin. Or, fermentation of the milk sugars would cause the milk to curdle. The galloping motion of the horse, acting as churning, would effectively separate the milk into curds. The result, curds and whey, provided a refreshing whey drink as well as curds, which would be drained through perforated earthenware bowls or woven reed baskets, and lightly salted to provide a tasty and nourishing high protein food. However, any people with milking animals would have “discovered” cheese and yogurt in a similar way. Any shepherd or farmer taking milk along with him in the stomach of slaughtered animal that is used as a canteen; or the beneficial microflora in a milkmaid’s oak bucket feeding on the simple sugars in the milk, releasing lactic acid that increases the acidity and causes coagulation. Before long, people learned that the curds could be aged over weeks or months, and then, pressed together to form large cakes of cheese. Most scholars agree that the art of cheesemaking traveled from Anatolia (Asia Minor) to Europe, where it flourished in the hands of the Romans. It was the Roman culture that developed the art of cheesemaking as we know it today. Roman cheesemakers were skilled artisans, and the Roman culture developed many varieties of cheese that resemble those we enjoy today. The Romans are credited with the first aging of cheese, or cheese storage. They were aware of the affects of various ripening techniques upon the taste and character of a particular cheese. It is likely that the Romans brought cheese and the art of cheesemaking with them as they conquered Gaul—what we now know as France and England—where it was embraced enthusiastically. The ancestors of today’s French cheesemakers did their job by perfecting the art of cheese aging, which today is known by the French term, l’affinage. Homer, circa 1184 B.C.E., refers to cheese being made in the mountain caves of Greece from the milk of sheep and goats, specifying a variety called Cynthos sold by the Greeks to the Romans (perhaps the Feta cheese of today). Aristotle, who lived from 384 to 322 B.C.E., commented on cheese made from the milk of mares and asses. Russian koumiss is made from mare’s milk and is fermented to provide an alcoholic content of up to 3%. Varro, circa 127 B.C.E., noted the difference in cheeses made from a number of locations and commented on their digestibility. By this time the use of rennet was commonplace, providing the cheesemaker with far greater control over the types of curd produced. Cheese had started to move from subsistence food, produced for home consumption, to a commercial product. Columella, circa 50 C.E., wrote about how to make cheese in considerable detail. Cheesemakers today would be perfectly at home with many of the principles he set out so clearly more than 1900 years ago. By 300 C.E., cheese was being regularly exported by Rome to countries along the Mediterranean seaboard. Trade had developed to such an extent that the emperor Diocletian had to fix maximum prices for a range of cheeses, including an apple-smoked cheese highly popular with Romans. Another cheese was stamped and sold under the brand name of La Luna, possibly the precursor of today’s Parmigiano-Romano, the name of which first appeared in 1579. Like other areas of knowledge, Roman cheesemaking expertise spread with their empire throughout Europe. Roman soldiers who had completed their military service and intermarried with the local populace, set up coloniae farms in retirement, where they may well have passed on their skills in cheesemaking. With the collapse of the Roman Empire around 410, cheesemaking spread slowly via the Mediterranean, Aegean and Adriatic seas to Southern and Central Europe. The river valleys provided easy access and methods adopted for production were adapted to suit the different terrain and climatic conditions. Goats and sheep provided plenty of milk. The Helvetians, a confederation of Celtic tribes, bestowed their name upon what is now Switzerland: Helvetia. Living in the area from about 800 B.C.E. to their almost-annihilation by the troops of Julius Caesar, in 68-69 C.E., they developed their own distinctive types of cheese. The cheeses were so popular that, for a period of time, all export of their Emmental (the cheese with holes that Americans call “Swiss cheese”) was banned. In Central and Eastern Europe, the displacement of people through centuries of war and invasion slowed down developments in cheesemaking until the Middle Ages. Production was often restricted to the more remote mountain areas. In the fertile lowlands of Europe, dairy husbandry developed at a faster pace and cheesemaking from cow’s milk became the norm. Edam and Gouda emerged in the Netherlands and were much copied elsewhere, under a variety of names such as Tybo and Fynbo. The hard-pressed cheeses, relatively small in size, brine-salted and waxed to reduce moisture losses in storage, were both marketable and easy to distribute. France developed a wider range of cheeses in the rich agricultural areas in the south and west. Soft cheese production was preferred; hard-pressed cheese appeared to play a secondary role. To some extent this reflects the Rome-influenced culture of the nation—mirroring the cheese types produced in the Mediterranean as opposed to the hard-pressed and more durable cheese that were developed in the northern regions of Europe, which could be stored and eaten during the cold winter months. However, throughout the Dark Ages (the Western European Early Middle Ages, circa 500 to 1000 C.E. ), little progress was made in developing new cheese types—or anything else. From the decline of the Roman Empire until the discovery of America, monks in monasteries were the innovators in cheesemaking. In the Middle Ages they developed many of the classic varieties of cheese marketed today. During the Renaissance (the European Renaissance spanned the 14th–16th centuries), cheese was considered unhealthy and suffered a decline in popularity. It regained favor by the nineteenth century, the period that saw the start of the move from farm to factory production. Goat cheese was perhaps the first to make their way to new world. Goats were carried aboard ships as a sure source of fresh milk. They were on the Nina, the Pinta, and the Santa Maria as Christopher Columbus sailed to the New World in 1492. When the Pilgrims voyaged to America in 1620, the Mayflower was stocked with cheese. The art of cheesemaking quickly spread in the New World, but until the 19th century it remained a local farm industry. It wasn’t until 1851 that the first cheese factory in the United States was built, by Jesse Williams in Oneida County New York. 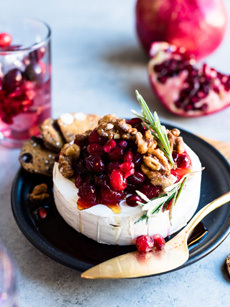 Simple and elegant: baked brie with a topping of cranberry sauce/relish or pomegranate arils (photo courtesy Liren Baker | Kitchen Confidante). 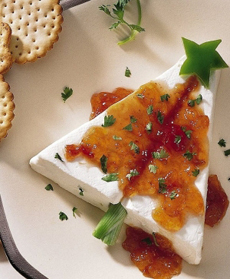 A triangle of cream cheese becomes a Christmas tree, with savory or sweet toppings. Here, it’s pepper jelly, chives, parsley and a bell pepper star (photo courtesy Indulgy.com). 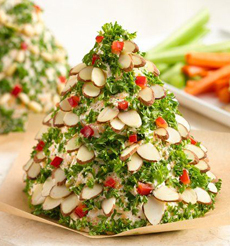 A cheese ball Christmas tree (photo courtesy Betty Crocker). 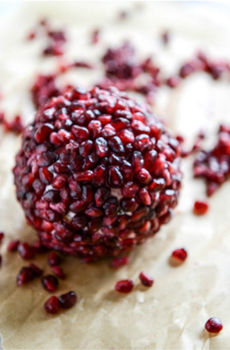 Sophistication is easy: Just roll a cheese board in pomegranate arils (photo courtesy How Sweet Eats). A cheese cube star (photo courtesy Cabot Cheese). 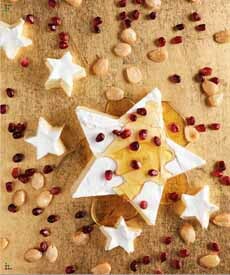 A brie star, with a drizzle of honey, pomegranate arils or dried cranberries, and marcona almonds (photo courtesy Eat Wisconsin Cheese). 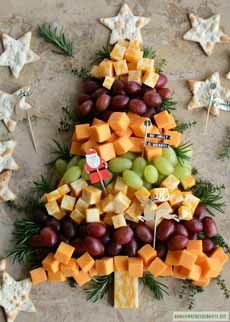 A cheese cube Christmas tree (photo courtesy Home Is Where The Boat Is). 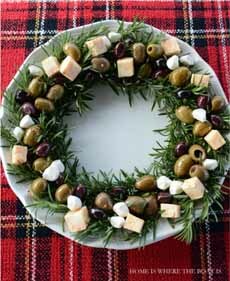 A rosemary wreath with cheese and olives (photo courtesy Home Is Where The Boat Is). 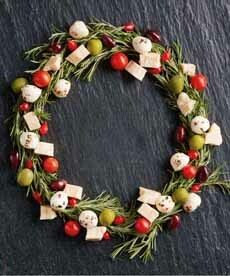 A more delicate rosemary wreath (photo courtesy Eat Wisconsin Cheese). 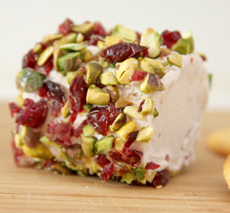 Roll a goat cheese log in dried cranberries and pistachios (photo courtesy More Than Hungry). The biggest cheese event occurred in 1801, when an enterprising cheesemaker delivered a mammoth 1,235-pound wheel of cheese to President Thomas Jefferson. Washingtonians dubbed it the “big cheese,” coining a phrase which has come to describe someone of importance. As the population of the country grew, so did the demand for cheese. The industry gradually moved westward and settled on the rich farmlands of Wisconsin. In 1845 a group of Swiss immigrants settled in Green County, Wisconsin and started the manufacturer of “foreign” cheese. The first factory was a Limburger plant, which opened in 1868. By 1880 there were 3,923 dairy factories nationwide, which reported to have made 216 million pounds of cheese that year valued at $17 million. The 1904 census, reporting only factory output, totaled over 317 million pounds, which grew to 418 million pounds in 1920…and to 2.2 billion pounds by 1970. Rising demand for cheese throughout the 1970s and 1980s brought total natural cheese production to more than 6 billion pounds by the beginning of the 1990s. Processed cheese also experienced a surge in consumer demand with annual production exceeding 2 billion pounds a year by the beginning of the 1990s. Currently, more than one-third of all milk produced each year in the U.S. is used to manufacture cheese. The industry continues to grow due to consumer appetites for all types of cheese—and pizza. Fine farmstead and artisanal cheeses are a fraction of a percent of the industry, but this sector, too, has been growing due to an increasingly sophisticated palate and demand for more and better cheese. The average American eats more than 31 pounds of cheese per year. Mozzarella is the most frequently-consumed cheese (think pizza) at 9.64 pounds per capita, followed by cheddar, long favorite eating and snacking cheese, at 9.39 pounds per capita. In supermarkets, processed American cheeses (580 million pounds), Cheddar (530 million pounds), and Mozzarella (250 million pounds) are the three big sellers. Americans have been branching out into specialty and artisan cheeses, averaging 4.3% of the volume in 2003, led by Asiago and Gorgonzola at about 50% growth, with Havarti up nearly 40%. With about 300 different varieties of cheese available in the U.S., 31 pounds per capita and deducting 9.6 for Mozzarella, it doesn’t seem like we’re eating nearly enough cheese! Source: International Dairy Foods Association and The Cheese Book by Richard Widcome, Chartwell Books, 1978.